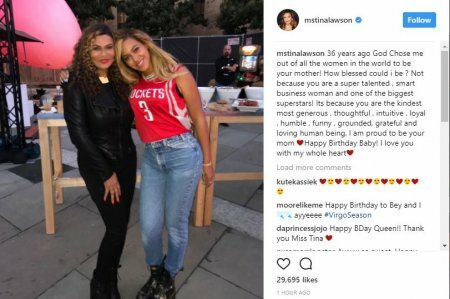 Beyonce mother, Tina Knowles Lawson has dropped heartfelt wishes to her daughter as she marks 36th birthday. Tina, in a lovely message to the star in her instagram post said she is proud to be her mother, not just for the reason that she's a star but because of her other virtues. "36 years ago God Chose me out of all the women in the world to be your mother! How blessed could i be ? Not because you are a super talented , smart business woman and one of the biggest superstars! Its because you are the kindest most generous , thoughtful , intuitive , loyal , humble , funny , grounded, grateful and loving human being. I am proud to be your mom ? ?Happy Birthday Baby! I love you with my whole heart??" she wrote.